Chemically Reacting Flow: Theory, Modeling, and Simulation, Second Edition combines fundamental concepts in fluid mechanics and physical chemistry while helping students and professionals to develop the analytical and simulation skills needed to solve real-world engineering problems. The authors clearly explain the theoretical and computational building blocks enabling readers to extend the approaches described to related or entirely new applications. New to this Second Edition are substantially revised and reorganized coverage of topics treated in the first edition. New material in the book includes two important areas of active research: reactive porous-media flows and electrochemical kinetics. These topics create bridges between traditional fluid-flow simulation approaches and transport within porous-media electrochemical systems. The first half of the book is devoted to multicomponent fluid-mechanical fundamentals. In the second half the authors provide the necessary fundamental background needed to couple reaction chemistry into complex reacting-flow models. Coverage of such topics is presented in self-contained chapters, allowing a great deal of flexibility in course curriculum design. Computer simulation of reactive systems is highly efficient and cost-effective in the development, enhancement, and optimization of chemical processes. 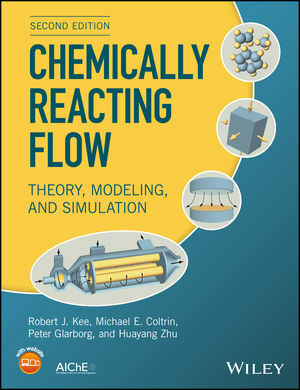 Chemically Reacting Flow: Theory, Modeling, and Simulation, Second Edition helps prepare graduate students in mechanical or chemical engineering, as well as research professionals in those fields take utmost advantage of that powerful capability. Robert J. Kee, PhD, is the George R. Brown Distinguished Professor of Engineering at the Colorado School of Mines in Golden, Colorado. Michael E. Coltrin, PhD, is a Distinguished Member of the Technical Staff at Sandia National Laboratories, Albuquerque, New Mexico. Peter Glarborg, PhD, is a Professor of Chemical Engineering at the Technical University of Denmark in Lyngby, Denmark. Huayang Zhu, PhD, is a Research Professor of Mechanical Engineering at the Colorado School of Mines, Golden, Colorado.